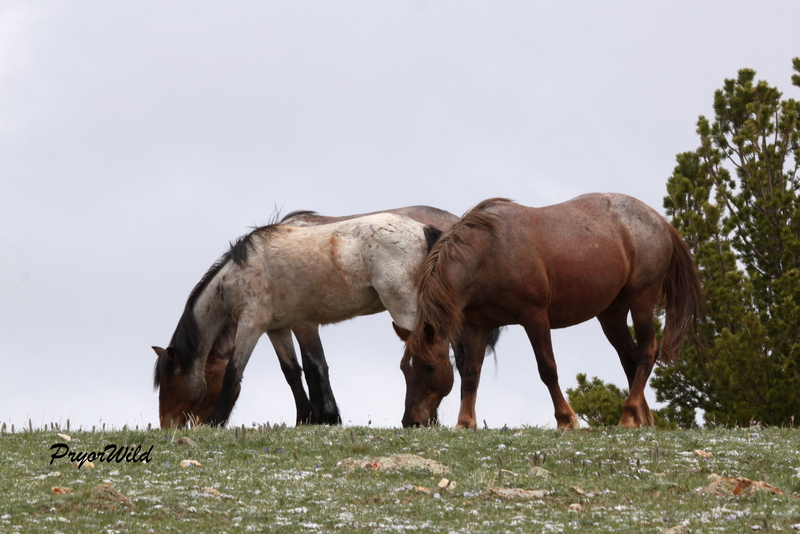 We had an amazing trip to the mountain yesterday….saw every mountain band with the exception of Hernando and Cappuccino. It is always exciting to see the beautiful Baja and his band. When we first arrived to the mountain top we spotted them off on the next ridge to the west, a place called either BLM Island or Cloud’s Island. By the time we got near the crossroads, we were surprised to see the band had arrived there before us and were moving across the road towards the snow-fed pond. 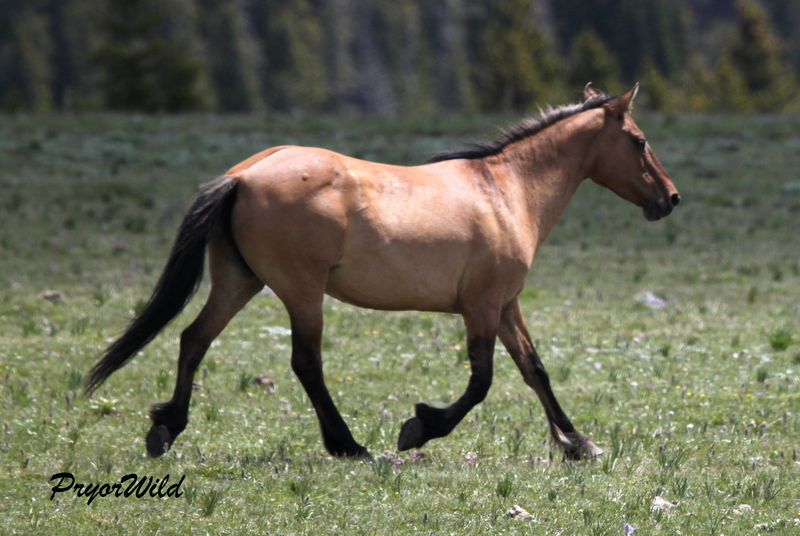 Lots of horses were on those upper meadows, but Baja just seems to keep his group away from the crowd! Baja has such a unique look to him. He is the son of the legendary Looking Glass and the classic mare, Tonapah. 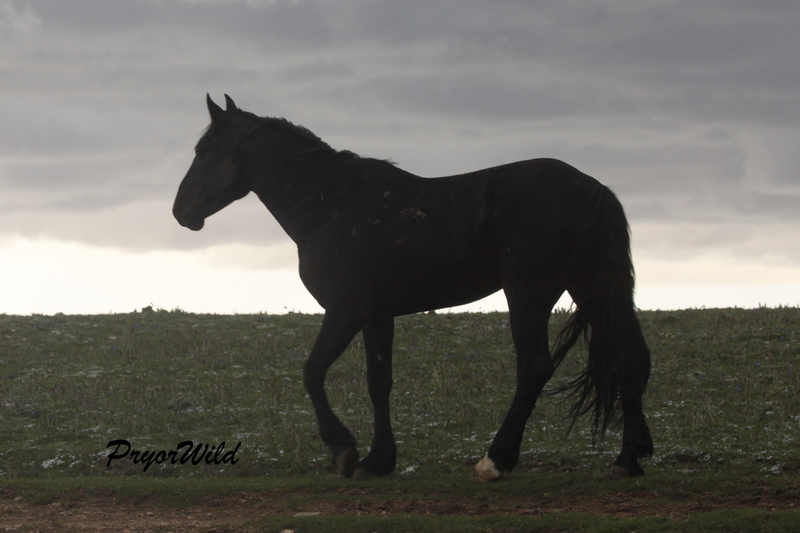 Baja’s 2013 son, Nahwa, was born later in the year. 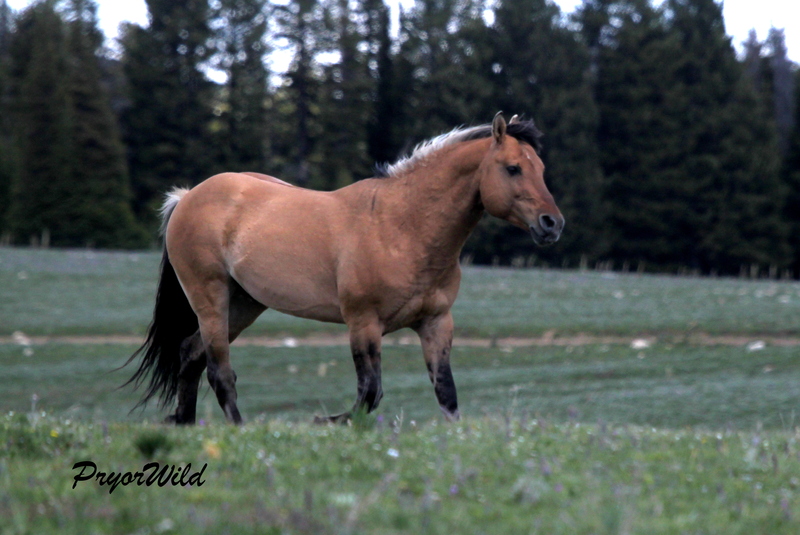 He bears a striking resemblance to his sire, Baja, with the distinct two-toned mane. 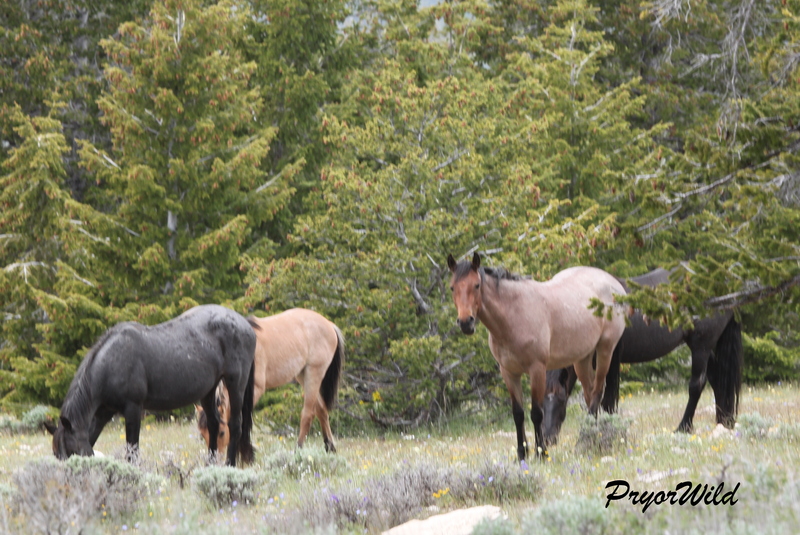 They is a trait also shared with Baja’s mom, Tonapah. 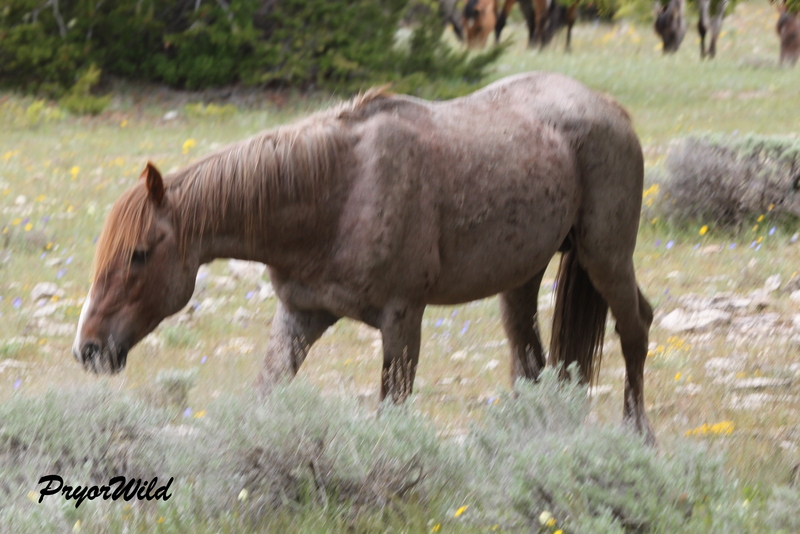 He is a sturdy colt and his still shedding off his winter coat. 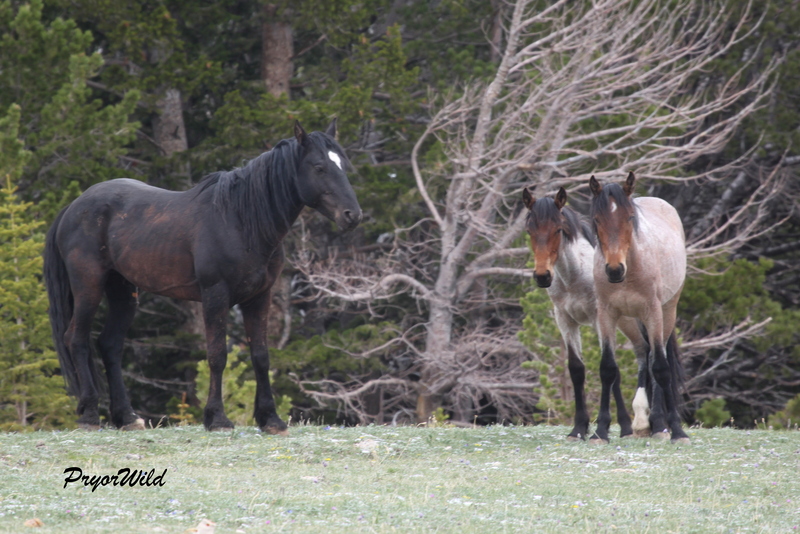 Baja’s mares, Washakie and Bacardi, have been with him for many years. Washakie is actually Bacardi’s mom. My observations show that mare bonds like this seem to contribute to band stability. Topper Too is a more recent addition to Baja’s band. Yet, she definitely took the lead today. She was the first one to come up the ridge to the crossroads. She was the first to lead out across the meadow. It was good to see Coronado/Red Raven with his band. We had heard that Coronado had lost his band earlier this spring to Irial (also known as Indigo Kid). But Coronado is definitely back at the helm of his band which consists of Blue Sioux, Adona, La Brava, Fool’s Gold and her 2013 colt, Nickle, the the beautiful dark buckskin pair of Dove and her 2012 daughter, Manuelita. All are not shown in the photos, but all were present and accounted for!! And…Santa Fe is trailing closely behind the band. La Brava along with Blue Sioux, Nickle, and Adona. A similar photo…this one with Fool’s Gold. 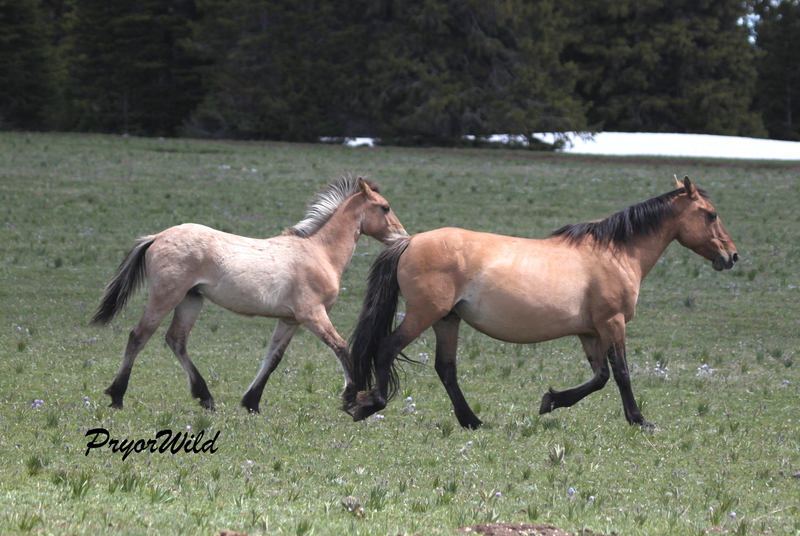 Fool’s Gold, the dun on the right, is the mother of Nickle, a 2013 colt, the dun on the left. 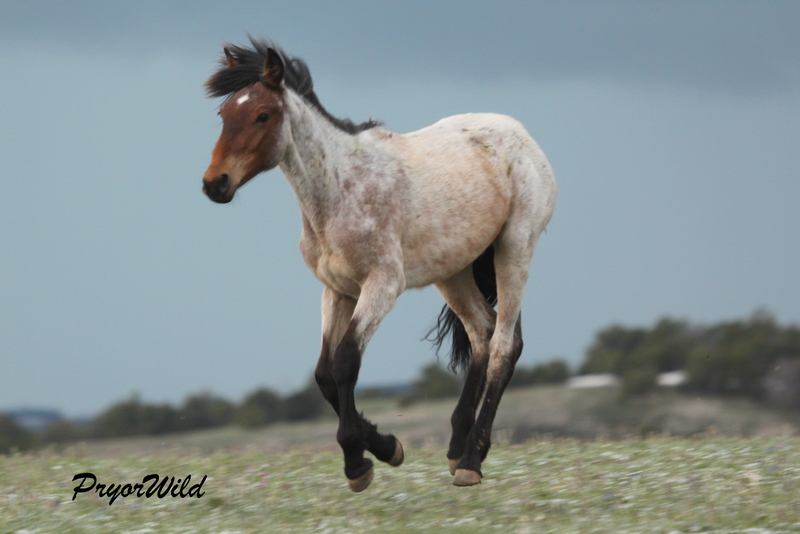 Manuelita: This 2012 filly is just beautiful! 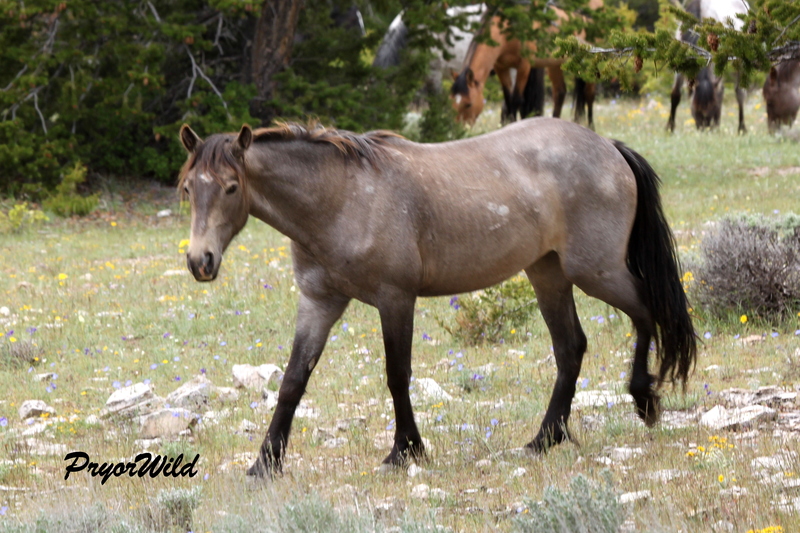 She shares her mother’s beautiful dark buckskin coloration. Santa Fe, follows behind the band. 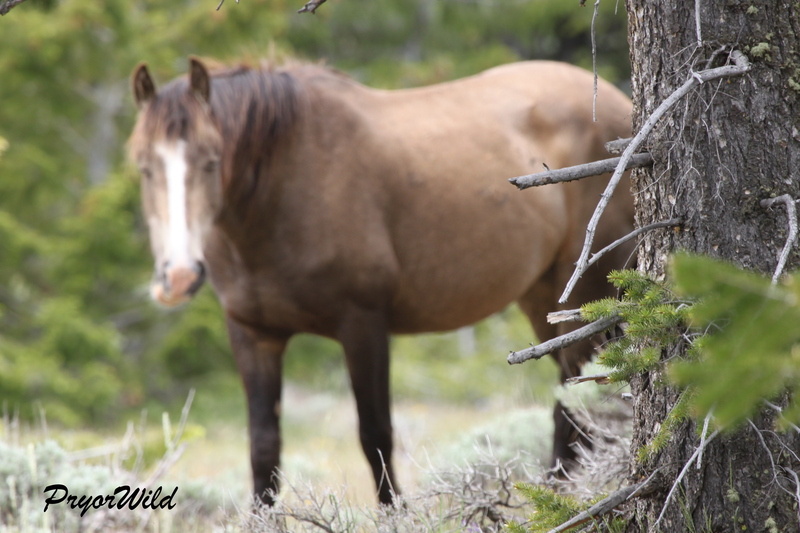 The stories of the Pryor horses are often of a bittersweet nature. Such is the story of Maelstrom and Niobrara. Upon the break-up of Jackson’s band earlier in May, these two young horses have had their lives changed. Both are the offspring of mare, Firestorm. Maelstrom, a colt, was born in 2012. 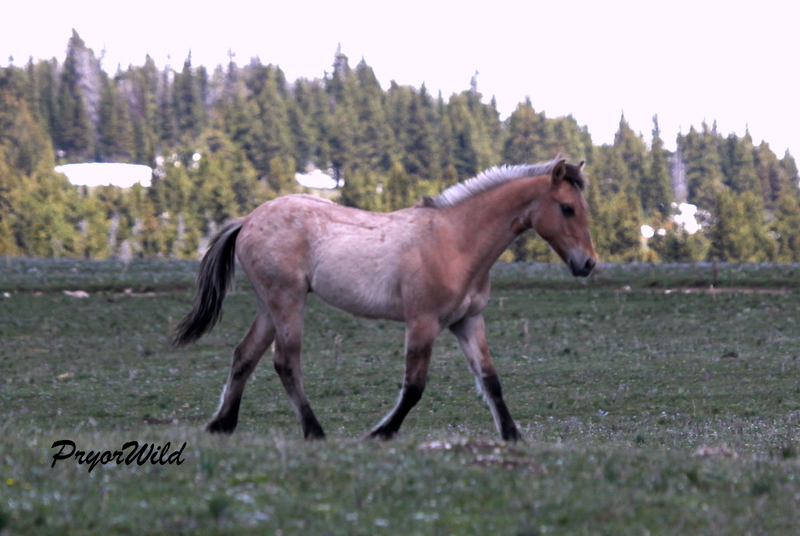 Niobrara, a filly, was born a year later in 2013. Both are beautiful bay roans. In addition, to the change with Jackson’s band, their lives were altered with the birth of their new brother, Okomi. The “bitter” part of this story is the two young roans were separated both from Jackson’s band and their mother. The “sweet” part of the story begins as the two young horses are accepted into Hernando’s band. 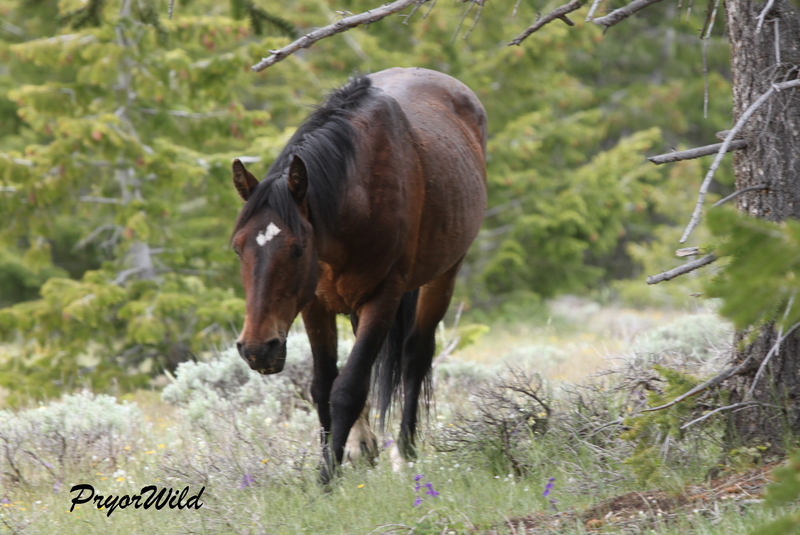 During the winter, Hernando, had successfully challenged veteran stallion, Teton (Diamond), to become the leader of the band consisting of two mares, Phoenix and War Bonnet. This was quite a feat for the young stallion, Hernando. 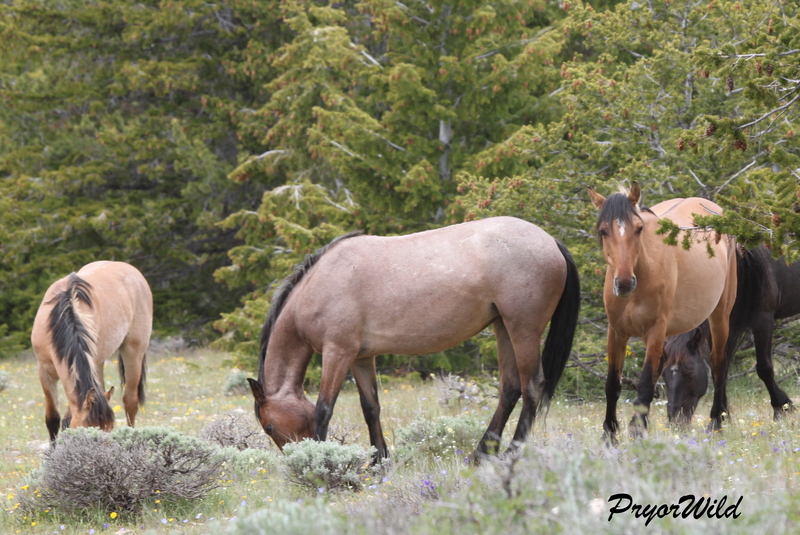 Phoenix and War Bonnet are both strong, wise mares. 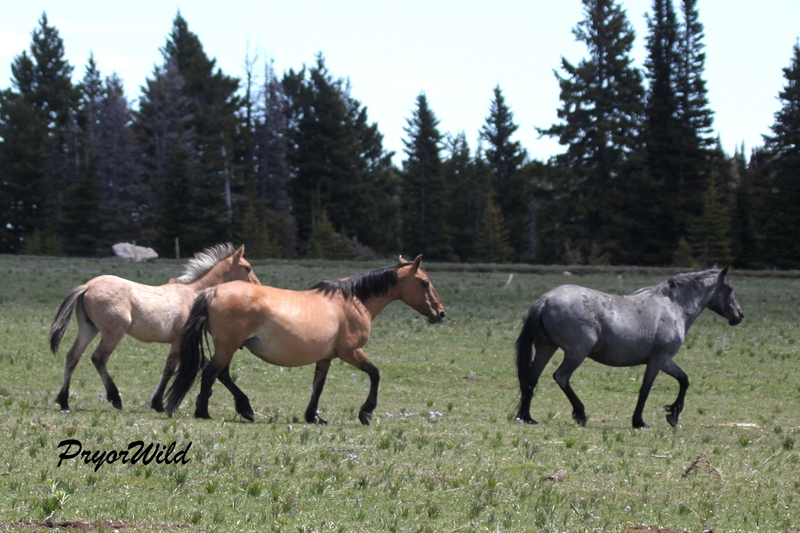 Shortly after the changes with Jackson’s band, Maelstrom and Niobrara became “adopted” by Hernando and his mares. It was a bit of a surprise that Hernando would be so accepting of the young colt, Maelstrom. There is something pretty special for these two horses to come under the care and protection of War Bonnet and Phoenix who are truly among the finest of the Pryor mares. War Bonnet seems particularly “motherly” to the two. On June 3, the weather on the mountain was ominous. Dark clouds had built up in the west and were moving quickly over the upper meadows. 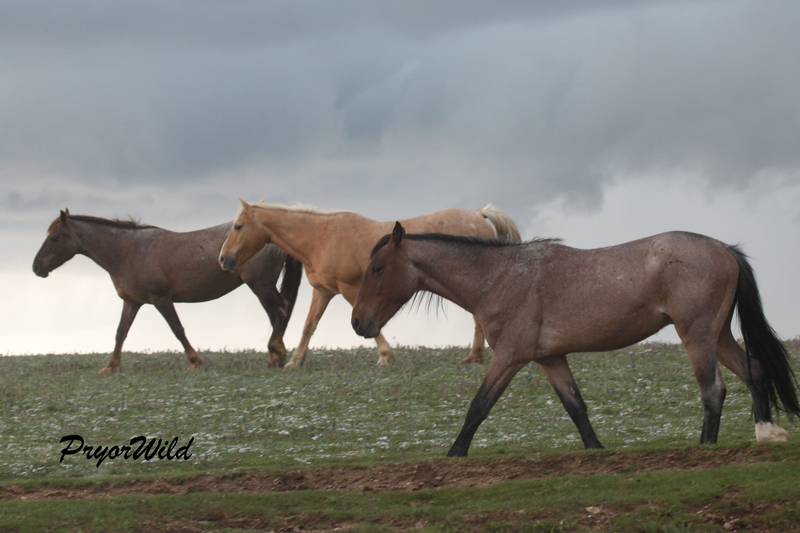 Hernando and his band had been grazing west of Pen’s Cabin as the storm approached. They wasted no time in heading east towards the forested area east of the cabin. The two young roans were clearly a part of the band. Niobrara was filled with exuberance as the band trotted to the east. On several occasions she took flight with all four feet off the ground! Hernando paused to check out the horses on the hillside below. For now, Maelstrom and Niobrara have found a new family to help them grow up in their Pryor home.